On the evening of 10th September, the 25th Teachers' Day, the Education Section of the Chinese Embassy in <?xml:namespace prefix = st1 ns = "urn:schemas-microsoft-com:office:smarttags" />London held a reception to welcome the recent arrival of Chinese-language teachers. 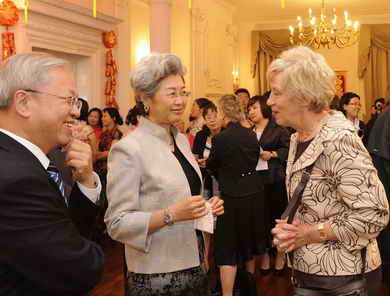 Ambassador Fu Ying attended the reception and made warm remarks. There were also attendants and speakers from the UK Department for Children, Schools and Families, British Council, HSBC and other organizations. Fu Ying began by sending holiday congratulations to the teachers. She said that with the steady growth of bilateral relations, China and the UK had had closer cooperation in the preparation for the Shanghai World Expo and London Olympics, and joint response to the global financial crisis. Fu said, there has been growing enthusiasm for Chinese-learning among students and parents here in UK. Selection of qualified Chinese-language teachers for primary and middle schools here began from 2001. The number of qualified teachers increased to 96 in 2008 from 11 at the very beginning. Given the differences between Chinese and English, persistence tends to be a headache for foreign Chinese learners. Step one therefore is to translate the interest of learners into sustainable learning habit and give them most efficient learning methods. She also hoped that the Chinese teachers can show more patience and thoroughness in their teaching, know more about the country, and build personal ties with faculties and students here. Fu Ying said that on its 60th anniversary, the New China had scored tremendous success across political, economic, cultural and social arena. Cooperation with China has been a major priority for the British government. President Hu Jintao attended the London Summit 2009, Premier Wen Jiabao made an official visit early this year and Vice Premier Wang Qishan came in May for the China-UK Economic and Financial Dialogue. Exchanges in culture and other areas are closer as well. However, the public here are insufficiently informed about China. Some even hold prejudice or stereotyped views, as frequently seen in the negative reports and commentaries on the media. The public on the whole only have a limited exposure to information about China. Ambassador Fu hoped that while fulfilling their teaching duties, they can also help the British people derive a genuine picture of China through their own words and deeds, be the face of China and bring the two countries even closer. The 87 teachers attending this year's Chinese-language teaching programme came from primary and middle schools across China. They were selected by experts of the two countries and subject to a 10-day intensive training course hosted by the Chinese Language Council International. Immediately after their arrival, they were sent to primary and middle schools in England, Scotland, Wales and Northern Ireland for one-year teaching service.